Posted by CNC Reporter on Nov 5th, 2015. The new TRT100 dual-axis rotary table from Haas Automation provides high-speed, accurate, 3+2 positioning and full 5-axis machining of small, complex parts. The unit’s compact size and light weight make the TRT100 the perfect dual-axis solution for small machining centers. Fast indexing speeds ensure short cycle times, and powerful brakes on both axes guarantee extreme accuracy. 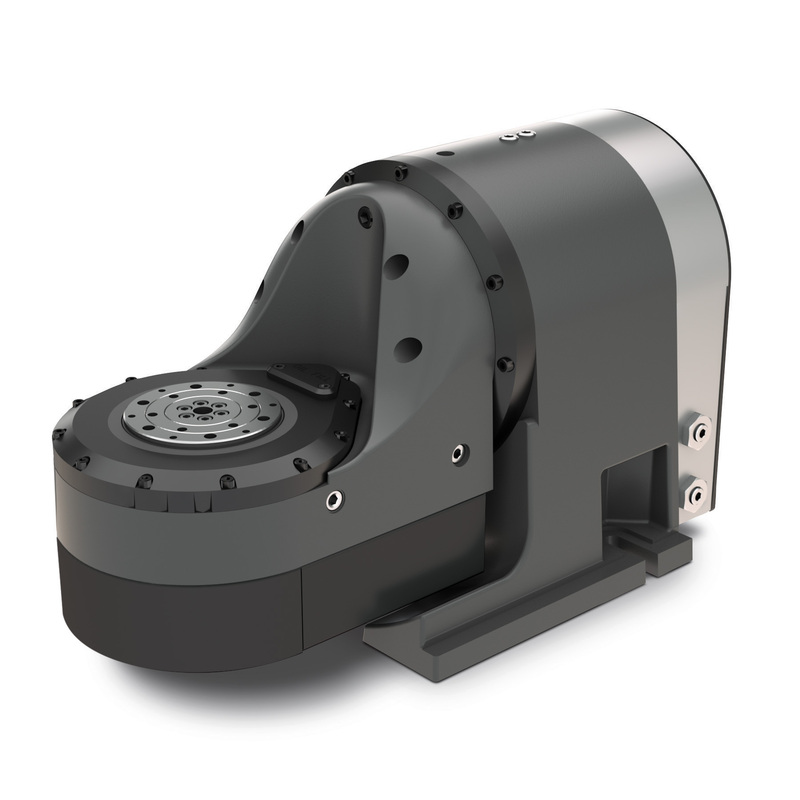 The TRT100 uses powerful brushless servomotors to provide 35 ft-lb of spindle torque on the tilt axis and 16 ft-lb on the rotary axis, with indexing speeds of 1000 deg/sec on both axes. The unit provides ±120 degrees of tilt and 360 degrees of rotation to position parts to almost any angle for machining. The precision-ground 100 mm platter features multiple bolt patterns and a precision through-bore for versatile fixturing, and will swing parts up to 8.4″ diameter. The maximum platter capacity is 15 lb for 3+2 machining, and 5 lb for 5-axis machining. A pair of user-configurable ports on the side of the TRT100 route air through the tilt axis to the rotary axis for operating pneumatic fixtures or other air-activated devices. At just 20″ wide and less than 13″ deep, the TRT100 easily fits into nearly any machining center, or can be mounted on one end of a larger machine’s table, freeing up the remainder for additional fixtures or vises. It is the perfect complement for Haas Automation’s high-speed DT-1 Drill/Tap Center and Super Speed VMCs. Like all Haas rotary tables, the TRT100 can easily be removed when not needed.